Korea’s medical community urged the government to prepare measures to fix the quarantine failure at the international airport, which led to the first confirmed case of the Middle East Respiratory Syndrome (MERS) in three years. 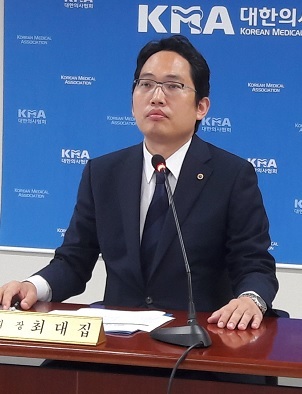 Choi Dae-zip, president of the Korean Medical Association (KMA), told a news conference that the patient’s direct visit to Samsung Medical Center from the airport and the medical staffs’ quick response stopped the infectious disease from spreading. “Not to repeat the mistakes of the 2015 MERS outbreak, the government has to come up with a tighter quarantine system,” Choi said. Choi made it clear the latest MERS case stemmed from the health authorities’ failure of quarantine management. “The recent confirmation of the MERS case and the patient isolation was done by a private medical institution, not a state-run one. The patient also voluntarily visited the hospital. This means that the authorities have failed to block an infectious disease from entering the country,” he noted. If the quarantine officials had paid attention to facts that the patient recently traveled the Middle East and reported stomachache and diarrhea, and visited a hospital in the Middle East, they would have sent the suspected patient directly to a medical institution, minimize the moving distance, and let the patient wear protective gear, the KMA head added. “I feel somewhat sorry that they missed him. We need more meticulous quarantine management,” he said. Choi suggested the authorities revise quarantine standards and guidelines for infectious diseases entering the country by medical criteria. “On the arrival card for travelers who stayed in or visited a contaminated region, the questionnaires should include whether the traveler ever visited a local hospital in the contaminated region. Through joint quarantine cooperation between states, the authorities should keep track of local hospitals together,” Choi said. He went on to say that the government should separate the health part from the Ministry of Health and Welfare to make effective responses to national disaster risks such as a MERS outbreak and enhance healthcare expertise for the public health. Choi emphasized that the recent confirmation of the MERS case can be an opportunity to check if there is anything to fix in the government’s three-year improvement of the quarantine control system. “We doctors will continue to communicate with the confirmed patient, those who had close contact with the patient, people who had daily contact, and the government to prevent the spread of MERS and to do our best for the health of the people,” he added.